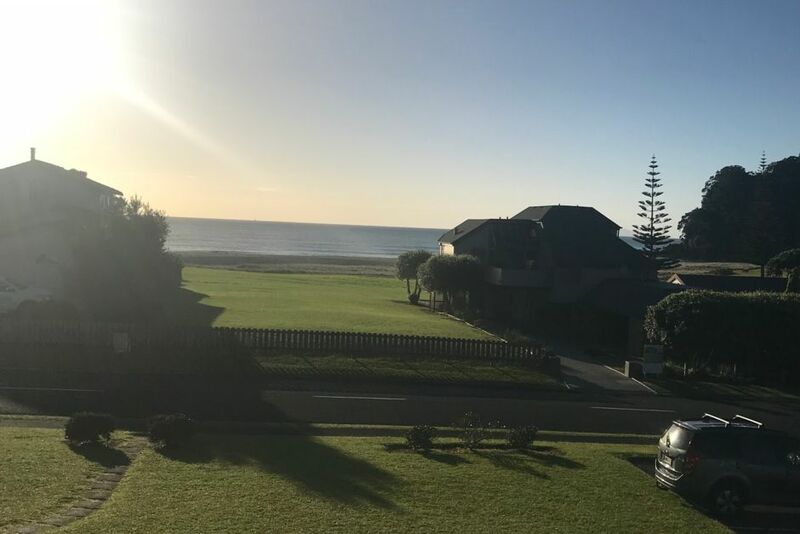 This 2 bedroomed unit is located across the road from the beach on the upper floor with great views of the surf and beach. It’s an Old school Bach. It has a small but fully contained kitchen and the living area has a TV with VCR, DVD, Freeview and a retro Super Nintendo Classic Mini Console . The main bedroom has a queen bed and fold out couch. The second bedroom has a queen bed and a set of bunk beds. The bathroom has a shower and basin with separate toilet. Across the road the reserve has a big playground for the kids, synthetic tennis courts, and a petanque court. Onemana has a Cafe and Dairy right next door to the apartment and there are plenty of local walks in and around the area. It is 10 minutes drive from Whangamata where there is a supermarket, range of cafes and restaurants and plenty of retail shopping. There is a dairy and cafe right next door. Special conditions: The following terms pertain to this rental: - Tea towels; bath towels; beach towels; and linen are not provided. Its an old school bach where you can relax. She is old and getting updated but there are many features that remind you of holidaying when you were young. Very comfortable apartment with a fantastic view of the ocean, felt very much at home and didn’t want to leave, can’t wait to come back again at some stage...Thankyou Rebecca and John for giving us the chance to enjoy your place. Glad you enjoyed the stay and made use of the fishing gear. We have had a look at the bunk and we will definitely put some extra bolts in for support - thanks! We had an all-too-short stay at this lovely bach but made the most of it! A classic, old-style bach but fitted out with just enough comforts to bring it up to today's needs (including some great board games :D). A great place for rest and recuperation which we were greatly in need of. It was so good to be able to simply wander down to the beach at any time of day or in the cool of the evening. Onemana is a hidden gem. Thanks Rebecca, much appreciated! I am so glad you had a good time and enjoyed out bach. You are welcome back anytime! The property was of good standing and looked great. The place and location was great. The apartment it's self was also well located. Overall we as a family had mixed reviews. Lots to do like puzzles and board games. The tv games are not worth tying to play bad quality, VHS is also old school I would rather there be Apple tv now days. Simple is more. The space it's self is nice but could do with modern furniture you can feel comfortable in. No fan or air con so the rooms were hot after closing the doors to stop bugs. The kitchen was well stocked and had extras which was great. Shower a bit small for me.. did not like the fact I get a cold bias when I turn off.. I think over all we enjoyed the time but felt it was never a place we could call our space with so much of the owners household things all over. It needs to be a beach batch vacation. Less is more when on vacation. The carpet and cleaning seamed to be like always and simple tiled floor would be good.